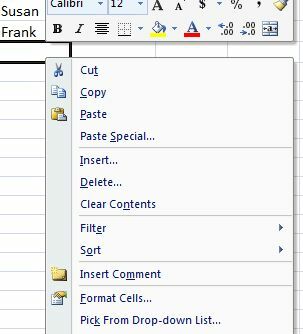 Excel presents an important function which helps handle and work with a lot of information we might use again in another cell. This is the list generation function. .
1) Lets make a list of random names from top to bottom. 3) We click on the right button of our mouse and a menu box with options will open. 5) And a list will pop up with the names we have already written. When we create a list of data in Excel, if we write a word that has the same first three letters as a word in the saved list, the previously listed word will appear automatically and shaded. You can either select it or write a new word. For example, lets say we are in a cell and we want to write the name "Sophie". Since we have already written the word "Susan" (and, they both have the same first letter), this name will appear automatically and shaded. Since this is not the name we want to write, we finish typing Sophie. If you wanted to write "Sophie" and it's already listed, click Enter when the shaded name appears and you won't have to finish typing it.